Incredible first line antihistamine for relief of symptoms associated with inhalant or contact allergies including irritated eyes, ears or skin, wheezing, licking of paws, head shaking or rubbing, scratching, hot spots, pimples, fur pulling and rashes. Works wonders for scratching, rubbing, foot chewing, fur pulling, rashes, throat, nose, ear and eye irritation. Clinically proven in eliminating most allergy sensitivities when combined with YUCCA INTENSIVE (steroid alternative), MEGA PET DAILY, SUPER C 2000 and GARLIC DAILY AID. 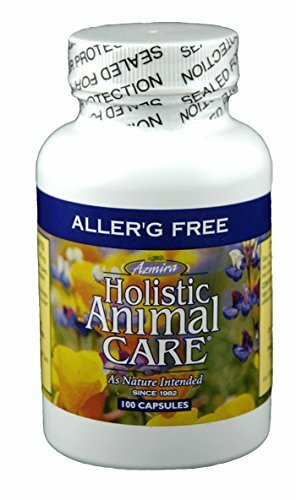 These easy to feed capsules, which support Dr. Newman's Holistic Animal Care LifeStyleTM approach to allergy elimination by systematically reducing acute symptoms while foundation supplements can build up the immune system, have supported even the most serious cases. If you have any questions about this product by Azmira Holistic Animal Care, contact us by completing and submitting the form below. If you are looking for a specif part number, please include it with your message.